JOSEPH R. OLEFIROWICZ – was born 1972, in Methuen, Massachusetts, near Boston. After his studies at Ithaca College, New York, he came to Europe in 1994 on the European Tour of Bernstein’s On the Town. His first engagement as a conductor in Germany followed, at the Capitol Theater in Düsseldorf, where he worked as Associate Music Director. 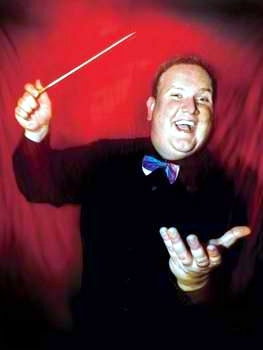 Shortly after his 1995 debut with the Oswego Opera Theatre in New York where he led productions of Menotti’s Medium and Schuman’s The Mighty Casey, he was appointed Music Director of the Bochum (Germany) production of Starlight Express. He progressed onto commercial musical theatres in Stuttgart and Berlin, and conducted the original productions of Miss Saigon, Disney’s The Hunchback of Notre Dame and as guest for Disney’s Beauty and the Beast. He worked in Budapest and London as Music and Choral Supervisor for the NBC/Hallmark production of Menken & Ahrens’ A Christmas Carol, and was presented an Emmy Craft Citation from the Academy of Television Arts and Sciences in Los Angeles for his contributions to this film. In 2003, he made his European opera podium debut with Cherubini’s Lodoïska at the Nordhausen Opera, where he then developed a broad repertory of Opera, Operetta, Musical Theatre, Ballet and Symphonic literature, as First Kapellmeister. His repertory encompasses a broad stroke from all facets of theatrical and concert literature, including: Aida, Der Freischütz, Madama Butterfly, Die Lustigen Weiber von Windsor, Tosca, Die Zauberflöte; La Belle Hélène, Frau Luna, Land des Lächelns; Anything Goes, Chess, A Chorus Line, West Side Story, Jesus Christ Superstar; Coppelia, and Ein Sommernachtstraum. In addition, Olefirowicz is an international concert organist in demand and since ten seasons, is the Artistic Director of First Music Concert Series and Director of Church Music for The First Church of Nashua (New Hampshire.) – The large choral and music program under his leadership, has been recognized twice by New Hampshire Magazine, as Best of New Hampshire 2012 & 2017. At the Vienna Volksopera, a long-standing relationship has brought him into his eleventh season as guest conductor. The revival of Fiddler on the Roof (Anatevka) in 2008 was his Viennese debut, and then followed premieres of Guys and Dolls, Abrahams Jazz-Operetta Die Blume von Hawaii, Bernsteins Candide (where became the world-reknown Internet sensation, the "Dancing Conductor"), in addition to the 2015 Austrian Musiktheater Preis award winning production of Sondheims Sweeney Todd, and the critically-acclaimed concert production of Kismet (Wright & Hall / Borodin), additional premieres of How to Succeed in Business Without Really Trying, Rodgers and Hammerstein’s Carousel, and repertory performances of Lehar’s Die lustige Witwe. Symphonic appearances include concerts at the Munich Philharmonic, the State Opera Unter den Linden in Berlin, Leipzig Opera, and Springfield Symphony Hall (USA), with orchestras including the Munich Symphony, Springfield Symphony Orchestra, Symphony New Hampshire, Orchestra of the Musikalischen Komödie Leipzig, the Loh-Orchestra Sondershauen, German Film Orchestra, and the Lower Saxony State Orchestra of Hannover. Most recently, he conducted his second premiere production with the Hannover State Opera in Germany, with the 2017 acclaimed new production of Bernstein’s West Side Story.